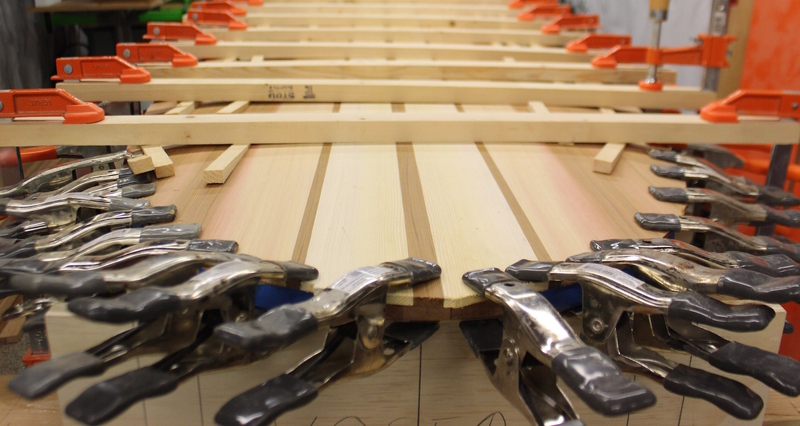 Wedges come in very handy during building a hollow wood paddleboard or surfboard. They allow you to apply even vertical pressure over a curved surface. Above wedges are being used with a strong back to attach the top skin. Wedges are really easy to make with either a bandsaw or tablesaw but your other option is to pick up some widow/door shims. A wedge can either be composed of one or two inclined planes. A double wedge can be thought of as two single wedges joined together with their sloping surfaces outward. I use single wedges in the works shop. Single wedges are very fast to make and by using two apposing wedges you create a nice flat/stable surface. I use 7″ long wedges with 1/2″ of rise creating 14 to 1 mechanical advantage. I choice this size because the ribs are spaced on 8″ centers and 7″ long wedges fit nicely between them. The 14:1 ratio works great as you can insert them by hand and the gentle slope has very little tendency to eject itself. You can see in this photo that I use a straight strong back with wedges applying the vertical pressure. 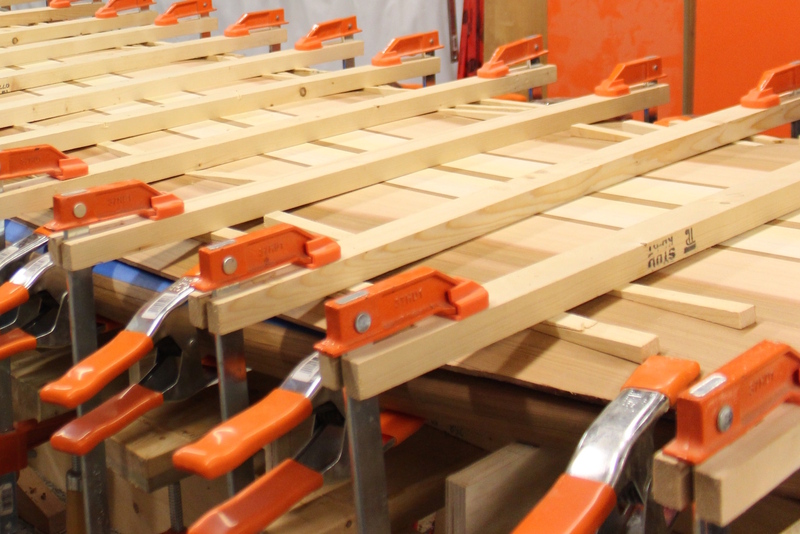 You could easily use twine (non-stretch) or a webbing strap instead of clamps to hold the strong-backs in position. In theory, you could just use webbing straps for installing the top skin but I haven’t tried this myself. This simple wedge jig for my bandsaw allows me to cut wedges from scrape 2×4. I prefer the 3/4″ wide wedges more than this 1.5″ wedge pictured so I usually rip them in half. Bottom view of wedge jig. 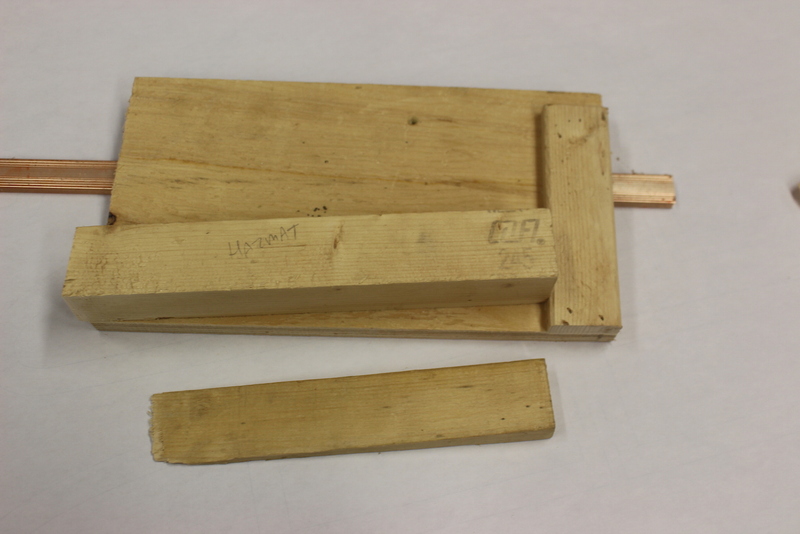 Firmly attach 3/8th by 3/4″ material (or what ever size material fits in a mitre slot is) to some plywood. The plywood should be reach a little past the blade as it is trimmed to length in step 2. Fit the jig in the mitre slot and trim it to the correct length. Measure the desired rise/run of your wedge and mark a line. 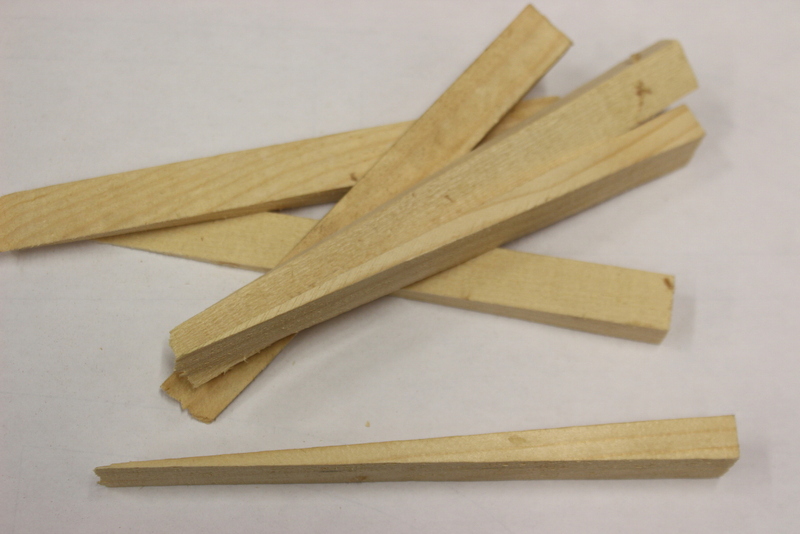 Attach the side support.Cut 7″ long pieces of your wedge material with the grain running lengthwise. After each wedge you should flip the block end-over-end to maintain a rectangle after every second cut. 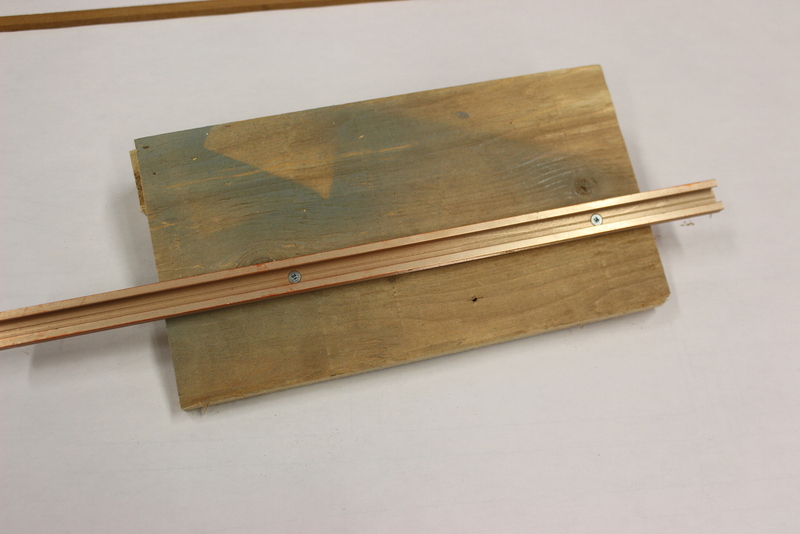 You can use a push stick to hold the wedge material in the jig as the stock get narrow. Your fingers are never close to the blade if used properly. There are many videos that show safe methods of making your own wedges. Here is the video I like for making wedges on a table saw.